Whitepaper - Ascender Technologies Ltd. Cloud rendering of modern graphics is typically performed via remote hardware rendering and pixel-based video compression techniques for image transmission. These solutions perform poorly, profligately expending both system and network resources. In response, Ascender Technologies developed novel enabling technology where the rendering of pixels is performed only on the local client, which makes for a much more affordable solution without expensive graphical hardware in the cloud. In addition, Ascender’scompression techniques reduce the networking overhead, typically by over an order of magnitude. Cloud Android Apps: Android apps can be run in the cloud and the graphics displayed on the local device. 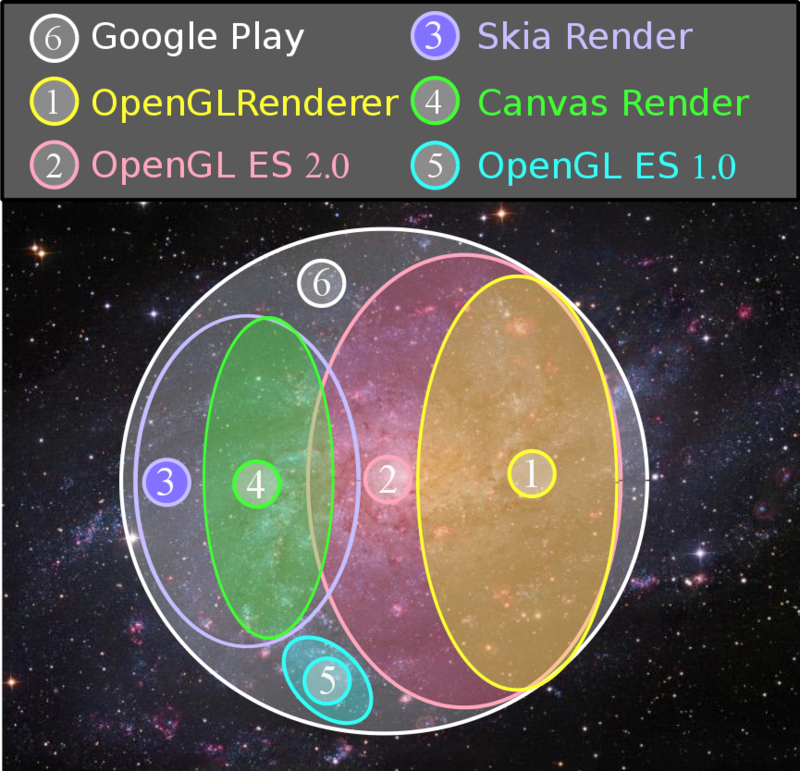 Five different Android rendering API’s (Canvas, OpenGLRenderer, OpenGL ES 2.0, OpenGL ES 1.x and Skia) were implemented and tested giving coverage of a large percentage of Android apps. This whitepaper contrasts the prevailing hardware solution for cloud graphics Fig. 1↓ with Ascender’s software solution Fig 2↓. The pressure to exploit cloud-based technologies is pervasive and ongoing. In parallel with the rise of cloud computing, modern graphic technologies (e.g. Android, IOS, OpenGL) have made it more difficult to implement remote graphics in the cloud. The reasons for these difficulties are manifold, some based on technology, some by design and some on economics. Ascender’s enabling graphical technology addresses all these difficulties and provides an economical solution. In section 2↓, we explain the challenges in implementing modern cloud based graphics systems. In section 3↓, we discuss the difficulties introduced by server-side pixel renderer solutions represented by the Nvidia Grid or AMD’s Radeon Sky. In section 4↓, we discuss Ascender’s elegant solution to the problems of remote rendering, otherwise entitled Remote Rendering - Local Pixels technology. In section 5.1↓, we discuss the applicability of Ascender’s technology to cloud gaming, a high profile industry - with inherent difficulties - believed to be the wave of the future. We detail a case study of Ascender Technologies’ techniques applied to a popular 3D game. In section 5.2↓, we discuss how our technology enables cloud based remote Android apps. The various rendering technologies used in Android are discussed as well as how their cloud implementations lead to “coverage” of the large base of Android apps. One use of our technology can lead to the much talked about “convergence” of Chrome OS and Android. We detail some case studies. Today almost half (49.4%) the peak network capacity of the Internet is consumed by just two sites Netflix and YouTube. Both are streaming compressed video which is appropriate for filmed material. Computer generated content (cloud gaming, remote apps) that currently normally uses the same streaming technology as filmed material has the potential to use large amounts of network bandwidth with corresponding costs. It make sense to optimize the streaming by using more efficient techniques than can be used for filmed video. This is one of the major goals of Ascender’s technology. The previous section describes difficulties intrinsic to cloud graphics, but there are also difficulties related to design decisions. In order to consider a concrete example of cloud graphics, we examine the current paradigm of cloud gaming, exemplified by the Nvidia Grid or AMD’s Radeon Sky. In this design, there is an array of GPU’s in the cloud. In the Nvidia Grid each GPU can support up to two remote cloud gamers. A simple argument demonstrates these ideas. 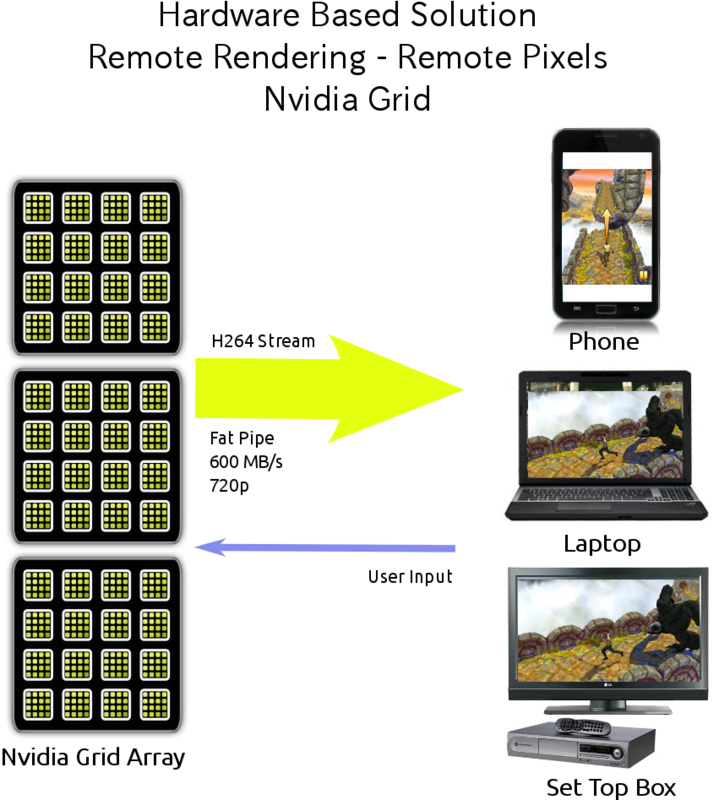 The published bandwidth for an Nvidia Grid H264 stream for a 30 fps refresh rate at 720p resolution is 600 KBytes/sec. This means that each hour of game play uses 2.1 GBytes of network bandwidth. The test case that we will examine as a typical game is the popular Android game Temple Run 2. This Android app is 31 MBytes. If we run this game remotely via the Nvidia Grid, for every 52 seconds of play we transfer as much video data as a complete download of the game app. In section 4↓ we describe Ascender’s rendering compression techniques and explain why it uses a fraction of the network bandwidth of H264. There are graphics systems that use a remote rendering level protocol and local generation of pixels. X11 and its OpenGL extensionGLX are well known examples. They unfortunately are not useful in environments where the round trip latency is large. 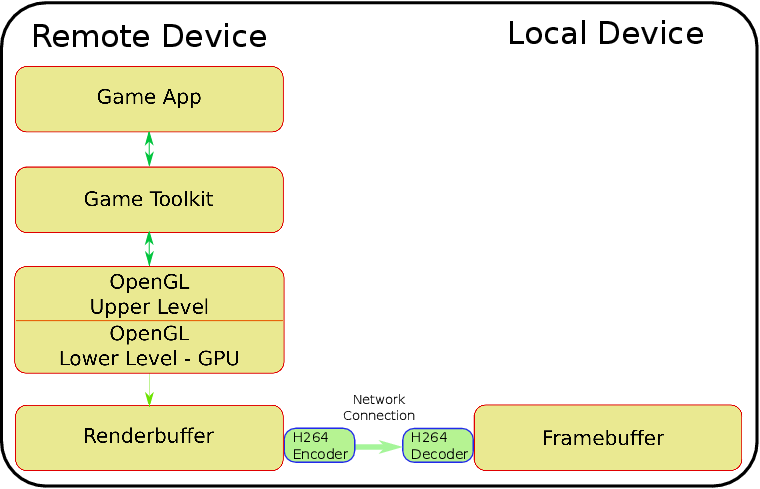 If an OpenGL application is run remotely on a low latency local network using GLX, it is possible to achieve a frame rate of a few tens of frames a second. The same application run on a network with tens of milliseconds latency will yield an unacceptable frame rate. The reason for this is that each OpenGL command entails a round-trip delay while waiting for the return value of the routine. The OpenGL return value semantics must be dealt with in practical remote rendering protocols. In order to understand the approach taken by Ascender Technologies, the rendering level, Fig. 4↓, is examined. This figure corresponds to our case study of a cloud game, the popular Android game app Temple Run 2. Although in this case the virtual host environment is a virtual Android system, a Windows or desktop Linux game would not change any essential details of the implementation. WithAscender’s technology, the local device need not be Android but can be any device which supports the rendering level software, in this case OpenGL ES 2.0. In contrast, Fig. 5↓ illustrates the system architecture of the typical server-side pixel renderer. Here we show remote execution of a non-mobile OpenGL game. Note that a hardware GPU is present on the remote device. Pixels are H264 encoded on the remote (cloud) device, sent via the network, decoded on the local device and displayed on the local framebuffer. Fig. 4↑ illustrates schematically the partition of the rendering layer into two levels, a general property of rendering software and not specific to OpenGL. On one hand, we don’t want or need to render pixels on the remote device (cloud). On the other hand, the game toolkit might need to interact with the rendering layer. For OpenGL, shader objects must be compiled and linked, uniform and attribute variables must be queried and bound to locations, etc. This duplex interaction is indicated by the two-way arrow between the “Game Toolkit” and the upper layer of the renderer. Note that the interaction between the lower level of the renderer (OpenGL ES 2.0), and the Renderbuffer is one-way (write only). For this reason, the lower level of the renderer can be circumvented since rendered pixels are not needed at the remote location. Also note that the flow of renderer commands is one-way from the remote to the local device. Even if only one round trip (remote-local-remote) were needed per frame, a 50 msec ping will constrain the frames per second (fps) to be less than 20 fps. There is a slight caveat to the one-way flow of renderer commands from the remote to the local device. 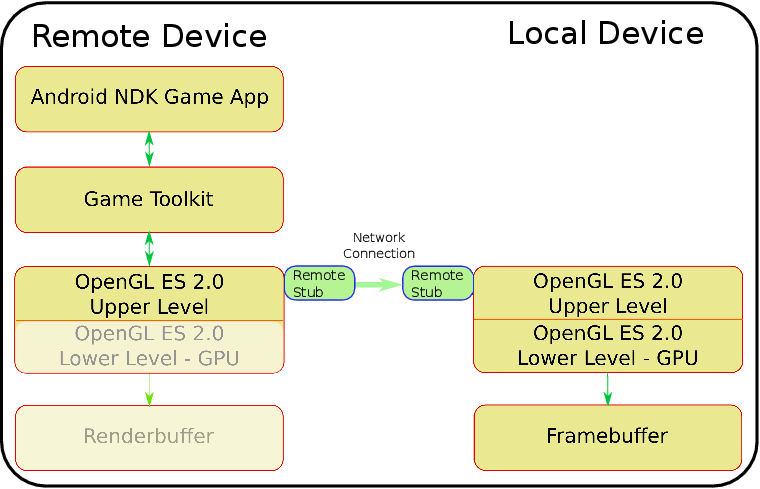 During initialization of the connection between the remote-local devices, the local device can send information to the remote side that will define the local device OpenGL API extensions and implementation-dependent limits. In addition, it might send a list of the cached textures and vertices present on the local device. After this initial interchange the rendering stream is one-way. This scheme can be implemented simply by taking a software-only OpenGL implementation, such as the open source Mesa software renderer and by deleting the code that actually renders pixels. The advantage of this approach is that by far the largest use of CPU time by the software renderer is in the pixel rendering. Hence, GPU hardware is needed in order to provide sufficient performance if the rendered pixels are required. However, if only the upper level API is needed, the computation load is low and GPU hardware is not needed. The upper level of the renderer must be run remotely to prevent render stream “stalls” caused by queries to the local renderer which would then entail round-trip latencies. This general scheme applies to other renderers. Skia, the pre-Honeycomb Android renderer library renders pixels in software. The Android toolkit queries Skia when it runs measurement frames. Here too, the actual rendering of pixels can be circumvented when pixels are to be rendered remotely. By not actually rendering pixels, Skia takes only a small fraction of the CPU resources it would normally use. The upper level of Skia must be run remotely to answer measurement queries without incurring round-trip delays. Ascender’s technology delivers an uncompromised solution to remote graphic rendering: None of the four performance measures are compromised in Ascender’s novel “Remote Rendering - Local Pixels” technology. We compare server-side pixel rendering, such as the Nvidia Grid, with Ascender’s technology for the four performance measures. Server-side Pixel Rendering: As discussed in section 2.4↑, some latency is unavoidable. Other latencies are caused by the choice of the encoding codec for the data stream. As described in section 3.3↑, the MPEG codecs are designed to have large encoding latency which contributes to efficient compression. For cloud gaming, this unintended consequence contributes to annoying latency. Ascender: The rendering codec is “immediate”: rendering commands are sent without significant delay. Since the compression algorithm works only with the knowledge of the previous rendering commands sent, the delay isw minimal. Once the last rendering command of a frame is encountered, the frame compression completes and sends the complete compressed frame. This is in contrast with the MPEG class of codecs which contains B frames that are dependent on data from future frames, thus engendering large multi-frame latencies. Server-side Pixel Rendering: As the inevitable resolution of display devices increases, high quality pixel-based systems scale as the number of pixels on the device. Thus, an upgrade from 720p to 1080p will entail a bandwidth increase of two (see section 2.5↑). The next jump to a Nexus 10 level device will need an additional jump in bandwidth by a factor of two. An upgrade to a new 4K Ultra HD device will need an additional factor of two. This march of technology will force an increase in bandwidth by a factor of 8 in just a few years. Ascender: As the resolution of the local display device increases, the bandwidth needed by the rendering stream remains essentially constant. The only difference might be an increase to larger pixel textures. The number of rendering commands in the render stream, which is the main determinate of bandwidth, remains constant. Server-side Pixel Rendering: With H264 compression-based systems there is always a complex balance between latency, bandwidth, resolution and image quality. A decrease in latency or bandwidth will cause a corresponding decrease in the quality and/or resolution of the video stream. The design criteria is normally “just good enough”. Ascender: The compression of the rendering stream is lossless. Since the rendering process is performed on the local host and is identical to what would be performed on the remote host, there is no loss in image quality. Server-side Pixel Rendering: Commercial cloud game suppliers offer 30 fps. True 60 fps, which is the modern graphics standard, would take double the current bandwidth. Ascender: As will be shown in the next two sections (5.1↓ and 5.2↓), actual tests show that the bandwidth for an uncompromised 60 fps compressed render stream is less than an order of magnitude of the bandwidth required for a H264-720p-30fps stream, which compromises all four performance criteria. A H264-4K-60fps stream will entail a bandwidth increase of 16x. The bandwidth for an equivalent resolution and frame-rate using Ascender’s techniques are less by more than two orders of magnitude. Ascender’s approach to remote graphics differs from the accepted prevailing solution which encodes the pixel stream with standard lossy video codecs designed to encode photographically generated video streams. In contrast, Ascender’s lossless compression algorithms are designed for programatically rendered graphics and are therefore many times more efficient than pixel-based methods for rendered graphics. To design a data compression scheme, the redundancy inherent in the data must be understood. By understanding how the data is generated, a model may be built that exploits probable correlations within the data. Examining a similar compression domain provides motivation to uncover techniques for compression within our domain. Video streams, whether photographically acquired, or photorealistically synthesized, can be compressed with MPEG standard codecs. Even though no specific technique used in MPEG compression is applicable for the compression of our problem domain (rendering streams), some of the assumptions about how the data sets are generated are similar and the compression model design is similar. Here we treat MPEG compression in a general manner, although in practice there are a number of incompatible MPEG standards. The material consists of a large number of sequential images (frames). The target of the video images is the human visual system and consists of moving images. The subject matter is a product of our everyday visual world and not some random series of random images. The apparent smooth motion observed is an optical illusion called the phi phenomenon that allows our brains and eyes to perceive continuous movement instead of a sequence of images. The effect is dependent on visual continuity between frames. By their nature, MPEG video streams are amenable to lossy compression. 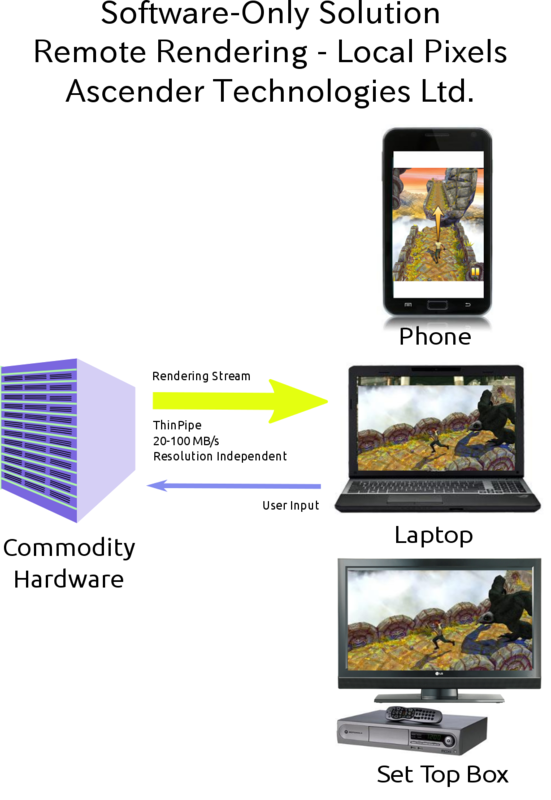 An analysis along the lines of the MPEG example can be performed to construct a compression model that efficiently compresses the remote-local rendering stream. The GUI rendering output domain is much more sensitive to degradation of image quality than the MPEG, so we will only consider lossless compression. The graphical rendering stream consists of a long sequence of rendering function calls with arguments. There are markers in this stream that indicate the end of a frame and the beginning of a new frame. The rendered material consists of a large number of sequential images (frames). The target of the synthesized images is the human visual system. The subject matter, while possibly not being a product of our everyday visual world, is modeled on the visual contexts of this world. We therefore see intensive use of continuous effects such as scrolling, swiping, cover flow, animations, etc. The images are generated frame after frame by repeated invocation of GUI procedures by the application software. This data model can lead to the following compression technique that we call procedural compression. In practice, the number of unique sequences of rendering functions in execution paths taken within the code are bounded. This is because the rendering commands are generated by a fixed number of GUI functions and the application is running a bounded amount of code. Conditional logic within routines can generate different execution paths, but even here the number of paths in practice is bounded. The execution paths can be incrementally learned and entered into a procedure dictionary as the rendering commands are streamed. An execution path that has been previously encountered can be transmitted by dictionary reference. Even if the sequences of rendering functions themselves are in the dictionary, the data arguments associated with these functions might be quite different from one another. Therefore, we keep a data dictionary of the arguments previously encountered. As a rendering procedural sequence with associated data is encountered, the data sequence dictionary for this procedural sequence is searched for the closest match to the current data sequence. Once the closest match is found, only the differences from this match are transmitted. 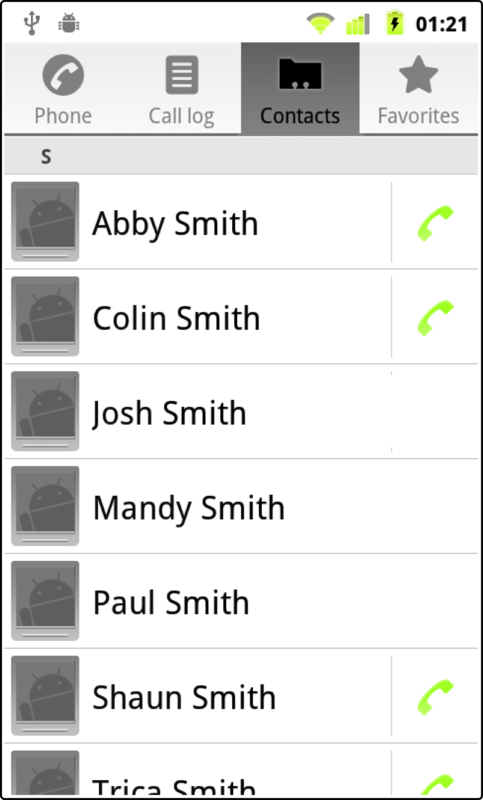 An example from Android’s Froyo contact manager illustrates these ideas. Here the rendering API of interest is the Skia software renderer. Fig. 6↑ shows a screenshot of a contact screen with seven entries. When we look at the rendering stream, we see that the code to compose one contact entry (as shown in Fig. 7↓) is run seven times in two variants. The first and the last two, have phone numbers attached to the contact and run different variants of the rendering code. As the first frame is generated, the code to render contacts is entered into the proceedure dictionary. When the second instance of this code is encountered, only a reference to the dictionary entry need be sent. The arguments differ partially for each entry. Thus, even for the first frame, intra-frame compression is effective. For subsequent frames as the contact list is scrolled up or down, each contact that appeared in previous frames will match both the code and data dictionaries and will have very small differences (mostly in the location of the entry). Thus, references to both dictionary entries for the code and for the closest matching argument data leave very little additional information that must be sent to render a contact. A careful examination of the rendering stream generated by the Android GUI reveals additional structural information that can be used to improve the data model. In this case the rendering API is the Skia rendering library. The rendering stream has balanced save()-restore() pairs for each frame of the rendering stream. A save() is found at the beginning of a GUI function and a restore() is found at the end of each GUI function. This bracketing information can be used to reverse engineer individual GUI and application procedures. It also reveals the call-graph of these procedures. Using this information, the rendering code dictionary becomes a rendering procedure dictionary. The call-graph data is best embedded in the per-procedure data dictionary. Although the reason for this might not be evident at first, it is very useful for GUI interfaces which frequently have variable procedure calls from defined procedures. This is typical of GUI software that might have container widgets with variable types of other widgets embedded. The ability to model better the rendering stream code source allows improved prediction of the rendering stream and increases the compression ratio. As the procedure code dictionary is constructed, a database of reverse engineered GUI procedures is built up. Since there is normally a bounded number of GUI procedures, we rapidly encounter and catalog the great majority of procedures which are a mix of toolkit and application level procedures. Ascender’s compression algorithm was tested on the rendering trace of a 60 frame sequence for the application shown in Fig. 6↑. There were 13702 rendering commands for an average of 228 rendering commands per frame. Of the 13702 rendering commands, there were 2691 functions (save/restore pairs). Of these, only 47 were unique. Only these 47 command sequences (routines) need to be transmitted to the local client and entered into the rendering procedure dictionary. This gives a compression rate of 1.75% (about 1:57). Of the 13702 rendering commands, only 354 had completely unique data parameter sets and 203 had data sets which are partially different. Only these 557 data sets must be transmitted, thereby giving data compression of 4.06% (about 1:25). If the partially different data sets are differentially transmitted, a data compression of 3.3% (about 1:30) is obtained. For the last stage of compression, general techniques such as run length encoding (RLE) and entropy encoding (Huffman or Arithmetic) are used to produce a minimum bit count representation of the compressed material. This additional phase should be expected to reduce the number of bits by a factor of 2-3. Ascender’s results show that compression can be an effective means to decrease the amount of data transmitted for a rendering stream. A compression of 1:100 compared to a raw render stream is typical. It should be appreciated that this compression is in addition to the approximate 1:100 compression ratio obtained from exporting graphics via the rendering stream as opposed to a raw video stream. 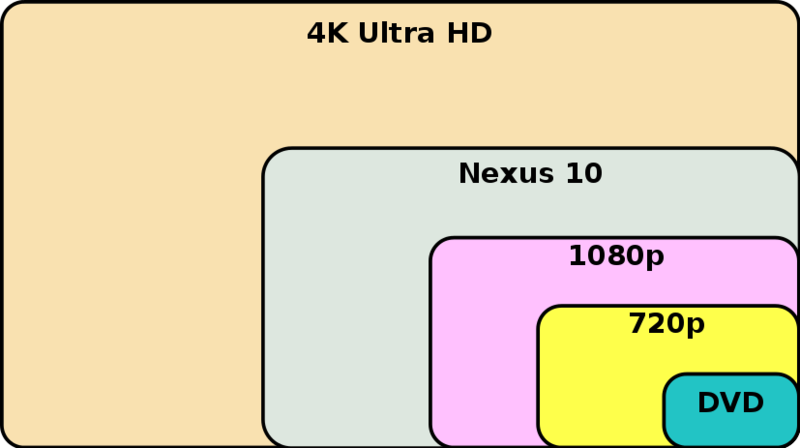 The effective compression as compared to a MPEG (H264) stream is typically between 10 to 50. OpenGL rendering streams have a different structure than Android’s other Skia-like rendering API’s. In the Skia influenced API’s, there are nested save/restore pairs that delineate rendering routines. The only reliable marker in a OpenGL stream is the end-of-frame (eglSwapBuffers) routine. A compression algorithm similar to the LZW (Lempel–Ziv–Welch) algorithm, which works on unstructured streams, can be used. Here too a remote-local synchronized dictionary can be dynamically constructed to enable compression in a manner very similar to the previous structured example. Bitmaps, textures, and vertices are objects that are referenced by rendering API’s repeatably and can be quite large. For Skia-like rendering systems, bitmaps are used. For OpenGL, textures and vertices are used. These elements are sent once and typically referenced many times. Care should be taken that these objects are sent only once and are cached for subsequent references. If these objects are not available when referenced, there might be a delay (i.e. a stall) of the frame while the object is being loaded. It is therefore important to schedule the pre-caching of objects before they are referenced. If the cloud server repeatedly runs an application, a statistical model of object usage can be developed. This probabilistic graphical model allows highly accurate pre-caching of objects with a low probability of rendering stalls due to data dependencies. MPEG Compression: MPEG uses lossy compression: within each frame the compression is similar to JPEG. It also uses interframe coding by encoding only the differences between nearby frames, both in the past and in the future. This forward interframe dependence can add undesired latency to the MPEG codec. The codec is asymmetrical, with compression being more computationally intensive than decompression. The most computationally intensive part of MPEG compression is the two dimensional search for motion vectors. Real-time compression is only practical for systems with specialized hardware to perform the heavy computations needed. MPEG normally requires a fairly constant bandwidth. Since the window of interframe comparisons is small, for low-latency MPEG compression, bitmaps or textures that make up the video images are effectively repeatedly sent from the remote to the local system. This is very wasteful of network bandwidth. Procedural Compression Compression: Rendering stream compression is computationally simple. The raw rendering API stream itself is much smaller than the raw video stream, typically by two orders of magnitude. The search in the dictionary for previously encountered sequences is one-dimensional and uses only previously encountered sequences in the stream. The complexity is similar to LZW (Lempel–Ziv–Welch) compression. No special hardware is needed. Bitmaps or textures are sent once and can be used to compose hundred of frames. Ascender’s remote rendering technology is applicable to many systems and platforms. In this section we examine two use cases and briefly mention a number of other use cases. Cloud gaming is a high profile service whose prevailing design has been discussed in some detail in section 3↑. In order to test the performance of Ascender’s remote technology, a cloud gaming test case was examined. Temple Run 2 is an “endless running” video game based on the Unity3D game engine. For this test, the Android version was used, with an OpenGL ES 2.0 rendering API. The size of the app download is 31 MBytes. The game ran at about 44 fps on the remote client a real, non-virtual, Nexus 7 tablet. The first “run” (until level two is reached) of the game took about 90 seconds, contained 3825 frames and had about 1 million rendering commands. The game itself pre-loaded approximately 5 MBytes of compressed textures and vertices, all textures needed for the full game during the first frame. Approximately 873 compressed bytes/frame is needed for the game play, excluding the downloaded textures and vertices. On the average each OpenGL rendering command takes 3.2 bytes compressed. The networking bandwidth needed for the remote graphics is about 38 KBytes/sec. In addition, an AAC audio stream will add something on the order of 35 KBytes/sec (which ironically is very similar to the bandwidth of the video stream). These values are summarized in Table 2↓. The rationale for separating the bandwidth needed for the download of textures from the bandwidth devoted to “game play” is that the textures are downloaded once, but the game play might continue for quite a while after all the textures are downloaded. If the local device has persistent storage, the textures needed for the game can be cached so the 5 Mbyte download need not be performed for the next game invocation. Even if the textures need to be downloaded for each game invocation, the time that the Android application takes to initialize the game on a local quad core Nexus 7 is about 8 seconds - the approximate time needed to download the 5 Mbytes of textures via a nominal 600 KBytes/s network connection to the remote client. For this reason, loading the textures will not change significantly the start-up time in the cloud gaming case. 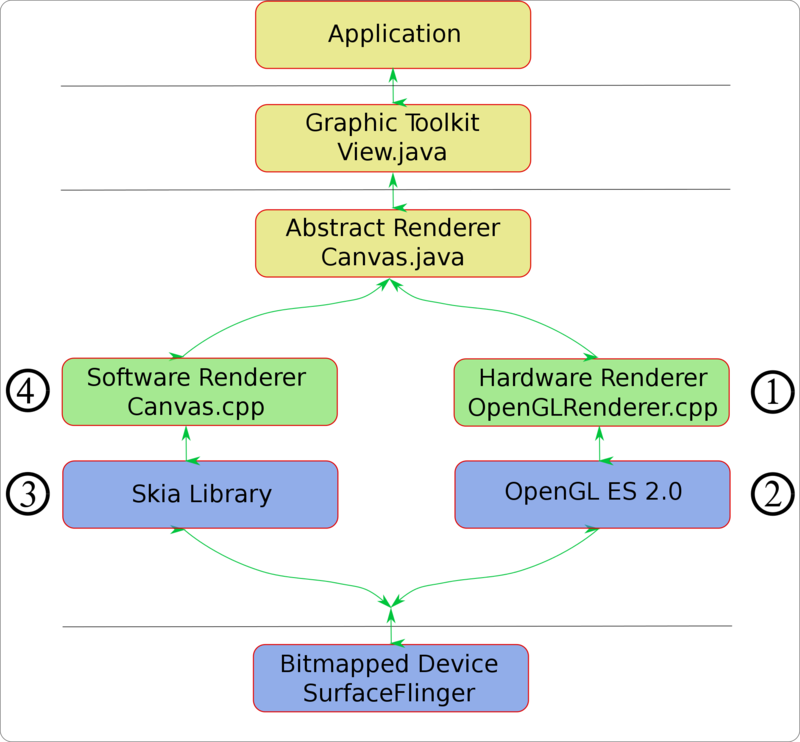 ➀ OpenGLRenderer.cpp If hardware renderer is enabled, the Canvas.java class uses the hardware renderer as shown in the somewhat simplified view in Fig. 8↓. The C++ class largely retains the Skia-like API of Canvas.java and has a similar API to the software renderer Canvas.cpp (➃) and the Skia library (➂). The ➀ (OpenGLRenderer.cpp) renderer API is completely covered by the ➁ (OpenGL ES 2.0) API. This means that support for the ➀ renderer is not critical. On the other hand, the bandwidth that this renderer uses is less than the bandwidth of ➁, so it pays to implement it for efficiency reasons. ➀ should be used instead of ➁ if possible. The reason compression is so effective on the OpenGLRenderer.cc stream is that the objects sent in the compressed rendering stream are entries from the synchronized “routine dictionary” on the remote encoder and the local decoder. These routines map to higher level objects from the application and toolkit levels that contain many renderer commands. Effectively, dynamic analysis of the rendering stream provides a reverse engineering of the graphical routines of the application and toolkit. The remote graphic technology presented is very general. It can apply to Android or a wide range of other systems. It is not necessary that the remote server and the local device have the same architecture: an Intel server can provide services for an ARM device. Below are scenarios of some use cases. Another possibility would be to provide data storage that is private to each client. This might be done with a private chrootenvironment for each client. In this configuration each local client would have private contact lists. Ascender’s novel enabling technology which provides remote access to modern graphical applications has been presented. We showed that this technology provides significantly better performance while using a fraction of the resources of the currently accepted practice. Fast, low-power 64 bit ARM multi-processors (e.g. Cortex A50) with virtualization extensions. Adoption of Android apps in a broad gamut of use cases, including the enterprise. Ever increasing adoption of cloud based solutions. The introduction of WebGL browser technology enabling web-based OpenGL ES 2.0 apps. Ascender’s method of transporting modern graphic interfaces.